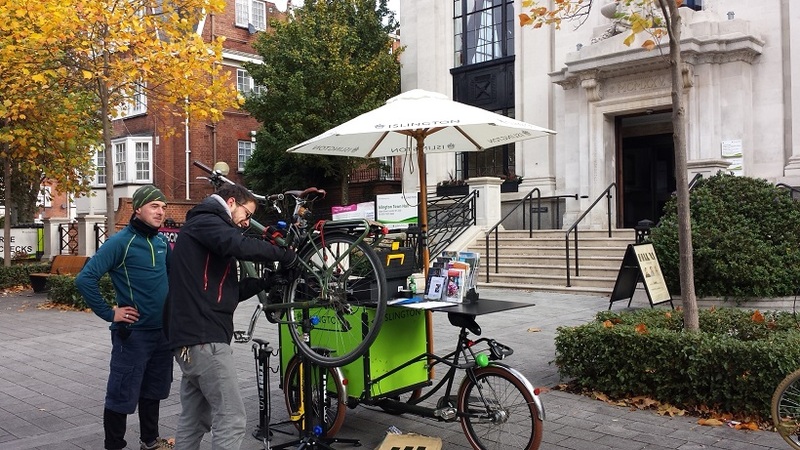 We run two monthly free Dr Bike sessions in the borough, and you are very welcome to turn up to either without booking. Outside Islington Town Hall on Upper Street: 4pm-7pm on the first Wednesday of every month, . We also organise pop-up Dr Bikes to support other events and organisations, so check our schedule at the bottom of this page to see if there’s one happening near you. At our Dr Bike sessions, our mechanics can check everything on your bike from wheels, brakes, gears and tyre pressure to lights, racks, pedals, saddles and more. By the end, your bike will feel loved and cared for. Any minor adjustments we can make to your bike, we do there and then. If there is something we can’t fix on site, we’ll let you know exactly what needs doing and a rough guide to what it should cost to repair at a bike shop. All our mechanics are friendly and approachable and have a wealth of cycling knowledge, so feel free to pick their brains about our cycle skills training or other cycling activities. For more information about Dr Bike sessions or to book a session for your organisation, contact us. If you are an individual looking to improve your own maintenance skills, check our bicycle maintenance classes page for details of our next free class. If you want to attend one of our public Dr Bike events, there’s no need to book – just turn up on the day. If your organisation would like to arrange a Dr Bike, please contact us. Dr Bikes are used by a variety of organisations and employers to promote regular cycling and the service is great for community events and cycling awareness days.